Dr. Zakir Naik is a well-known media personality, founder of the Islamic Research Foundation (IRF) in Mumbai, India in 1991. (The IRF’s web site has been suspended. See older versions in the Internet Archive.) He went on to establish Peace TV, a Dubai-based satellite channel on which he is a prominent speaker, in 2006. The channel began program distribution in English, and has expanded into Urdu and Bangla as well, seeking to serve both Muslims and non-Muslims in South Asia, the South Asian diaspora, and beyond. Naik, who trained as a medical doctor in India, studied under famed self-taught preacher, Ahmed Deedat (1918-2005). Deedat, who was himself born in South Asia, was known for specifically addressing issues that Christian preachers, often from the US, brought up while proselytizing in Deedat’s adopted country of South Africa. Deedat learned Christian scripture in order to be able to refute and debate with missionaries. Naik, who styles himself a student of comparative religion, used his medical training to frame narratives about the use of science proving the miraculous nature of the Qurʾān, a genre called iʿjāz ʿilmi or simply iʿjāz (Guessoum 2008; ElShakry 2008; Yazicioglu 2013; Bigliardi 2014). Although this genre has more than a hundred years of history, it became far better known in the 1980s with the work of Maurice Bucaille (1920-1998), a French surgeon (and Christian) who set out to compare the Bible and the Qurʾān on their depictions of science, and decided that the Qurʾān fit better with the scientific facts that he marshaled (Bigliardi 2012). Naik has been recognized in Saudi Arabia (Hubbard, 2015), the United Arab Emirates, and Malaysia, winning awards. Naik, learning to preach at the height of both Deedat’s and Bucaille’s fame, used these science narratives as a centerpiece of his preaching. Starting in 1994, we have recordings of Naik’s talks, including one of his most famous, “The Qur’an and Modern Science: Contradiction or Conciliation?” Naik’s presentations were famous for being memorized, delivered, unlike Deedat, without any notes, often for longer than an hour. The presentations linked specific scientific “facts”, like the Big Bang, with Qurʾānic verses. Naik would provide translations and explanations, which critics often note are full of errors of translation and fact. For instance, one part of the talk includes a substantial list of verses that are supposed to be evidence of the Qurʾān’s discussion of the water cycle (evaporation, rain, etc), yet those who have checked the cited references find that some of them do not mention water at all (The Masked Arab, 2014). Another hallmark of Naik’s talks are question and answer sessions which follow them, in which audience members queue at several microphones and ask questions of Naik. Depending on the topic of the talk, the questions vary, but scientific topics often come up and are addressed by Naik, including questions that have been controversial in the Muslim world, such as biological evolution and organ transplantation. Naik also produces scientific “facts” to support ritual practices such as growing a beard or performing the daily prayers. These Q&A sessions sometimes last as long as the talk itself. In recent years, Naik has focused more on trying to convert non-Muslims, who are encouraged to ask their questions first. In this sense Naik’s material seems to be moving more toward Christian understandings of missionary activity than Muslim constructions of da’wa (the call to Islam), which often are focused on bringing straying Muslims into correct practices as much as on converting outsiders. It is this question of who, exactly, is an outsider that is of interest with Naik’s works. Muslims in India are a minority community, and Naik’s talks, even when they are given in Muslim majority areas like Dubai, seem more focused on Muslim minorities, such as Dubai’s South Asian diaspora. Naik’s organization has fostered off-shoots, particularly in Europe, where the iERA, a youth-oriented outreach group, has been active promoting similar science narratives. Inherent in many of these narratives is that those who promote “science” are automatically construed as atheists, suggesting that believing Muslims cannot be, for instance, practicing evolutionary biologists. Although Naik often constructs his scientific narratives around Western scientists who supposedly agree with his views, he ignores Muslims who have long spoken out in disagreement to his constructions, even those who are practicing scientists of long standing (Lewis 2011). In this sense, although he sometimes presents himself as being balanced and “rational”, he is, in the end, just promoting a particular kind of Islamic practice, one that would be at home in Saudi Arabia, for instance. Naik’s talks are memorized, and given over and over again around the world, often to quite substantial audiences. His talks have diversified over time, although elements of iʿjāz often crop up even when the talk titles have nothing to do with it. In this sense, these narratives structured around science seem to be the core of Naik’s personal brand. The recordings of his talks have been moved to Internet video platforms, such as YouTube, DailyMotion and Tune.pk, where they are curated by users appropriating Naik’s name as well as by users apparently using their own names. These videos have drawn a wide array of both critique videos as well as spoofs. Some of the questions Naik draws from the audience can become heated; one video clip of Adnan Jahangir, a young former Muslim medical student, asking Naik about biological evolution, exists in hundreds of copies around the Web. That clip in particular has been presented by both supporters and detractors of Naik, with each side claiming it depicts Naik either winning or losing the argument, depending on the perspective of the curator. As of this posting (September 2017), the Indian government is continuing with its efforts to prosecute Naik and the IRF. Most recently this includes a letter to INTERPOL requesting that it not comply with requests from the Indian government (Anand, 2017; “Zakir Naik appeals to Interpol”, 2017). Click HERE to see all the content on the Portal about Zakir Naik. There is a substantial amount of polemical coverage of Naik. We have attempted to be cautious here, but breaking events with Naik’s legal problems may find more polemical postings. Anand, U. (2017, August 31). Zakir Naik Accuses ‘Hindu Nationalist’ Modi Govt of Targeting Him Due to Religion. News18.com Retrieved from http://www.news18.com/news/india/zakir-naik-accuses-hindu-nationalist-modi-govt-of-targeting-him-due-to-religion-1505905.html. Associated Press. (2010). Britain: no entry for preacher with radical views in Islam. New York Times. New York: New York Times. Retrieved from http://www.nytimes.com/2010/06/19/world/europe/19briefs-PREACHER.html. Bangstad, S., & Linge, M. (2015). ‘Da’wa is Our Identity’ — Salafism and IslamNet’s Rationales for Action in a Norwegian Context. Journal of Muslims in Europe, 4(1), 174-196. Bezabeh, S. A. (2015). Living across digital landscapes: Muslims, Orthodox Christians, and an Indian guru in Ethiopia. In R. I. J. Hackett & B. F. Soares (Eds. ), New Media and Religious Transformations in Africa (pp. 266-283). Bloomington / Indianapolis: Indiana University Press. Bigliardi, S. (2012). The Strange Case of Dr. Bucaille: Notes for a Re-examination. The Muslim World 102: 248-263. _____. (2014). Islam and the Quest for Modern Science: Conversations with Adnan Oktar, Mehdi Golshani, Mohammed Basil Altaie, Zaghloul El-Naggar, Bruno Guiderdoni and Nidhal Guessoum, Istanbul: Swedish Research Institute in Istanbul. Bolognani, M. (2010). South Asian media in the Noughties. Contemporary South Asia, 18(4), 367-372. Dhume, S. (2010). The Trouble with Dr. Zakir Naik. The Wall Street Journal. Retrieved from http://www.wsj.com/articles/SB10001424052748704365204575317833268479268. Eisenlohr, P. (2016). Reconsidering mediatization of religion: Islamic televangelism in India. Media, Culture & Society, 1-16. ElShakry, M. (2008). The Exegesis of Science in Twentieth-Century Arabic Interpretations of the Qur’ān. In: van der Meer JM and Mandelbrote S (eds) Nature and Scripture in the Abrahamic Religions: 1700-Present. Leiden / Boston: Brill, 491-524. Farrell, M. (Producer). (2015, 11 April 2016) Banned in India, Peace TV Net Buys Berth on TWC in N.Y. Retrieved from http://www.multichannel.com/banned-india-peace-tv-net-buys-berth-twc-ny/389891. Guessoum, N. (2008). The Qur’an, Science, and the (Related) Contemporary Muslim Discourse. Zygon: Journal of Religion and Science 43(2): 411-431. Hafeez, M. (2016, October 31). Fearing arrest, Zakir Naik skips father’s funeral in Mumbai, Times of India. Retrieved from http://timesofindia.indiatimes.com/city/mumbai/Fearing-arrest-Zakir-Naik-skips-fathers-funeral-in-Mumbai/articleshow/55145865.cms. Hubbard, B. (2015, 3 March 2015). Saudi Award Goes to Muslim Televangelist Who Harshly Criticizes U.S. New York Times. Retrieved from http://www.nytimes.com/2015/03/03/world/middleeast/saudi-award-goes-to-dr-zakir-naik-a-muslim-televangelist-who-harshly-criticizes-us.html?_r=0. Khan, T. R. (2015). Beyond Hybridity and Fundamentalism: Emerging Muslim Identity in Globalized India. New Delhi: Oxford University Press. King Salman grants Dr. Zakir Naik Saudi citizenship. (2017, 19 May) The Siasat Daily (India). Retrieved from http://www.siasat.com/news/watch-king-salman-grants-dr-zakir-naik-saudi-citizenship-1186731/. Larkin, B. (2008). Ahmad Deedat and the Form of Islamic Evangelism. Social Text 96, 26(3), 101-121. Lewis J.R. (2011). How Religions Appeal to the Authority of Science. In: Lewis, JR. and Hammer, O. (eds.) Handbook of Religion and the Authority of Science. Leiden / Boston: Brill, 23-40. Linge, M. (2013). The Islamic Network: A Case Study of how Salafi da’wa emerges, mobilizes and transforms in a Norwegian context. Université Saint-Joseph, Beirut. Mårtensson, U. (2014). Harakî Salafism in Norway: ‘The Saved Sect’ Hugs the Infidels. The Nordic Welfare State, 8i, 190-222. Sadouni, S. (2013). Ahmed Deedat, Internationalisation, and Transformations of Islamic Polemic. Journal of Religion in Africa, 43, 53-73. Samuel, G., & Rozario, S. (2010). Contesting science for Islam: the media as a source of revisionist knowledge in the lives of young Bangladeshis. Contemporary South Asia, 18(4), 427-441. Schwartz, S. (2015, 27 March 2015). Zakir Naik, Radical Islamist Video Evangelist. The Huffington Post. Retrieved from http://www.huffingtonpost.com/stephen-schwartz/zakir-naik-radical-islami_b_6945990.html. Syal, R., & Harding, N. (2011). Banned scholar Zakir Naik to address Oxford Union by satellite. The Guardian. Retrieved from http://www.theguardian/politics/2011/jan/28/zakir-naik-oxford-union-satellite. Yazicioglu, I. (2013). Understanding the Qur’anic Miracle Stories in the Modern Age, University Park, PA: Pennsylvania State University Press. Zakir Naik appeals to Interpol to turn down red notice plea. (2017, September 1) Daily News and Analysis (India). 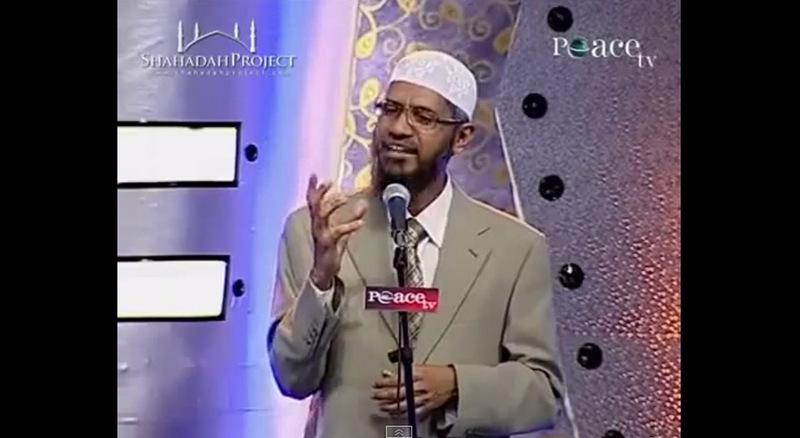 Retrieved from http://www.dnaindia.com/india/report-zakir-naik-appeals-to-interpol-to-turn-down-red-notice-plea-2542124.